While all divorces are challenging, military service presents unique and complex issues for service members and their families to navigate. Whether the former spouse of a service member may retain health insurance coverage through TRICARE is one. TRICARE is a health care program for uniformed service members and their families. Depending on several requirements and criteria, it may be possible for divorced spouses to remain covered under TRICARE and receive the same benefits as the service member. If the service member has completed at least 20 years of creditable service, the spouses were married for at least 20 years, and all 20 years of marriage overlap the 20 years of military service, the former spouse will remain eligible to receive TRICARE benefits. If the service member has completed at least 20 years of creditable service, the spouse were married for at least 20 years, and at least 15 of the years of marriage overlap the 20 years of creditable service, the former spouse will remain eligible to receive TRICARE benefits for 1 year after the divorce is finalized. 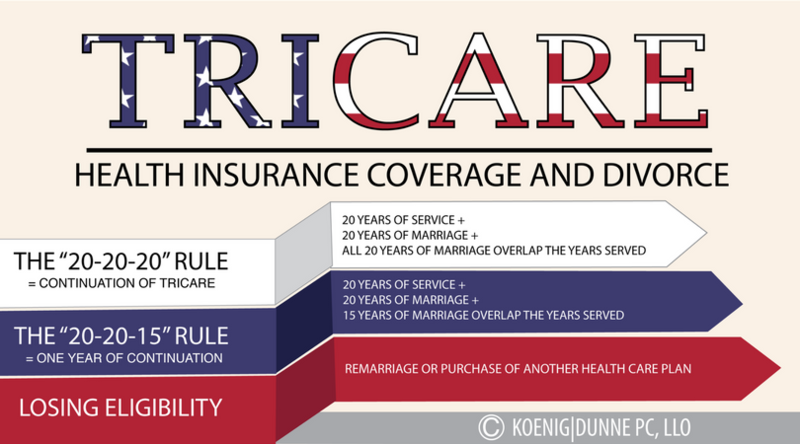 For those former spouses that do not meet either the “20-20-20” or the “20-20-15” Rules, the former spouse’s TRICARE benefits will end at 12:01 a.m. on the day the divorce if finalized. For those former spouses, it’s important to seek alternate health care options. One option the military provides is the Continued Health Care Benefit Program. The Continued Health Care Benefit Program is a premium-based plan that provides temporary health insurance coverage for former spouses for up to 36 months after the divorce is finalized. After your divorce, a former spouse can lose eligibility for TRICARE coverage if he or she remarries or purchases and is covered under an employer-sponsored health insurance plan.